Simply click on your preferred price and see instant results within your price range! This newly developed and picturesque community of Torrey Highlands is ideally located just 10 miles from the coast and 25 miles from Downtown San Diego. Designed as a peaceful and family-oriented community with a vibrant urban flair, this area is home to a broad range of real estate opportunities. 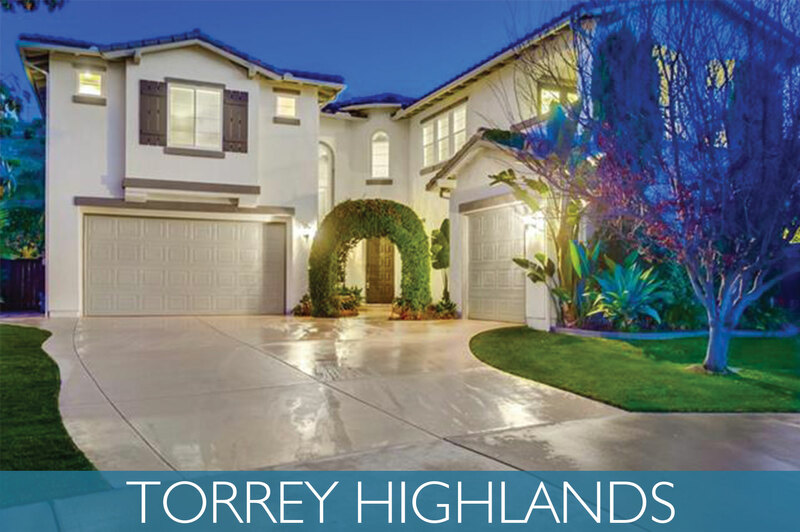 From large single-family homes to luxury condos, Torrey Highlands real estate offers an incredible range of properties with scenic canyon and mountain vistas. Additionally, a new development has been proposed, Merge 56. It will be a commercial and housing community on the edge of Torrey Highlands, where SR-56 meets Camino Del Sur. It will offer a mix of housing types including townhomes, units, and single-family homes. View more about Torrey Highlands on Pinterest! Recreation is a major part of Torrey Highlands life. Approximately 30% of the acreage in the community has been designated for parks, hiking and biking trails, and open space including Canyonside Community Park, Torrey Highlands Dog Park, and Los Penasquitos and McGonigle Canyon Preserves. Developers maintained the integrity of the natural landscape while building exquisite properties. The hub of Torrey Highlands is the 90,000 square foot upscale village center that integrates retail outlets with a residential community, providing the convenience of shopping, dining, and living all in one place. In addition, the Plaza 56 Business Center includes spaces for medical firms, biotechnology labs, and a number of other company offices. Businesses both large and small realize the amazing potential of this area and are moving their companies nearby. Torrey Highlands is home to the renowned Westview High School, which is part of the sought after Poway Unified School District. Torrey Highland’s schools are nationally acclaimed for their state of the art infrastructure, stunning sports facilities, and commitment to academic excellence. This dedication to providing a top-of-the-line learning environment is just part of Torrey Highlands' meticulous planning in providing their residents the best community for families.